I am having a tidy up of PDF files I have down loaded at various times and printing them out as I have found that leaving them on the computer means they get forgotten if I am not careful. So expect a few more pointers to gems like this over the next couple of weeks. In the process I found another gem in the Antique Pattern Library. I think readers will enjoy but you might need to invest in some printing ink. The full and wordy title is A Treatise on Embroidery, Crochet and Knitting with illustrations adapted to the use of M.Heminway and Sons’ Wash Silks (Oriental Dyes). 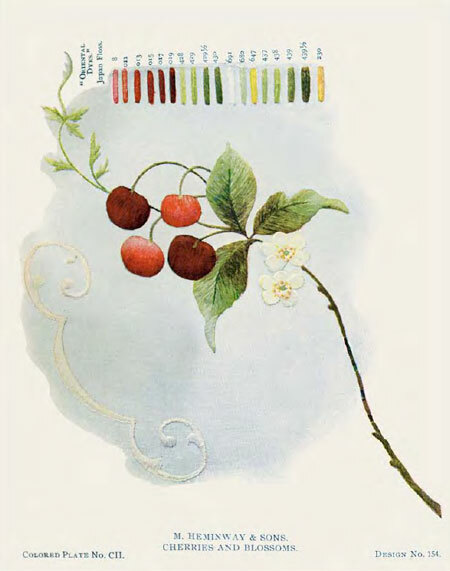 This gem was published in 1899 and is available from the Antique Pattern Library. You will need Acrobat Reader to open and read these files. You can download a free reader on the Acrobat site. This post is eye candy heavy but I hope people will realise that the book is worth downloading and enjoying. Embroiderers you will discover a number of different combination stitches in the first section of the book. You can see the influence of crazy quilting. I think crazy quilters will this section particularly interesting. Also this is the type of book where I find variations to stitches for instance I found an interesting variation of of “buttonhole feather stitching” on page 15. I will have to investigate it further because at first glance it looks like closed Cretan stitch but my point is that this is just the sort of source where I find interesting variations of stitches. it is easy to dismiss these books because the illustrations are hand drawn and they are old fashioned but they are a huge resource. There is a growing interest in thread painting. I thought I would highlight this a there are some lovely patterns in this book. Apart from some really lovely embroidery patterns also included are some alphabets which are always handy. 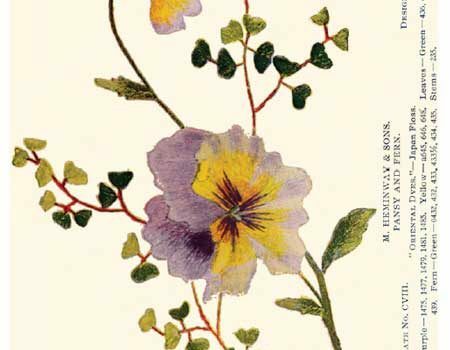 These fantastic designs look as if they are classic botanical illustrations. Sorry about the heavy eye candy but there is some very nice material in this book and I encourage you to look at it. 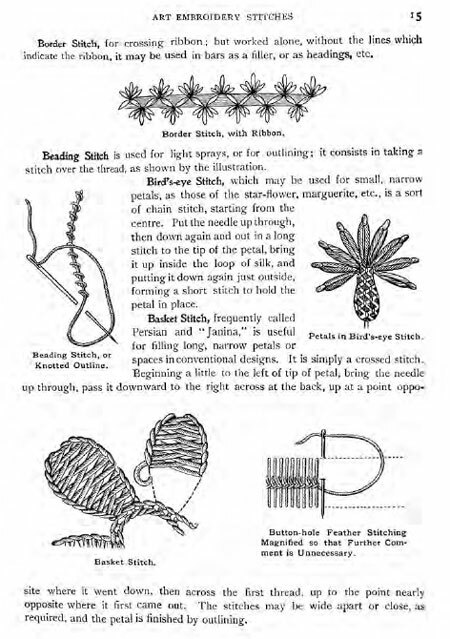 From page 56 onwards there is small section on Drawn thread work before moving on to Crochet, Lace and knitting. Since I am not a knitter I can not really say how useful some of these patterns are but I did like some of the sock patterns! Hi Sharon, thanks for the heads-up for this super looking book. I have downloaded other files from the Library but cannot find this one. Which section is it in? Thank you for posting about these wonderful resources. Very much appreciated! I have downloaded quite a few pdf files from that Antique Pattern Library. It is a real treasure trove of wonderful patterns. Thanks for sharing this Sharon. I have downloaded it as there are some lovely patterns in it and as you say it is a great resource.